The Alfa Romeo 159 started development in June 2001 and was designed to compete in the D segment of the car market this puts it directly against the Audi A4, BMW 3 series, Mercedes C class and the Lexus 200. 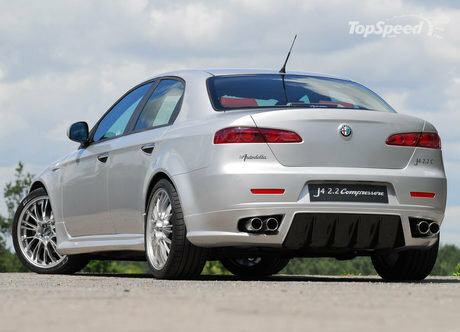 The Alfa 159 is named after the famous post war formula 1 car the Alfetta 159 and was styled by Giugiaro’s Ital Design, the design departs from the Alfa 156 and looses the hidden door handles but retains a distinct family resemblance, when the two cars are parked together they appear as brother and sister the Alfa 159 being slightly larger in everything but roof height. The sharply creased front wing tops lead to a higher shoulder line that drops down to the front air dam, this gives the car a wide and aggressive stance. The rear end of the car is very similar to the 156 but the combination of individual rear lights and strong crease line across the boot give the rear a much more muscular look.